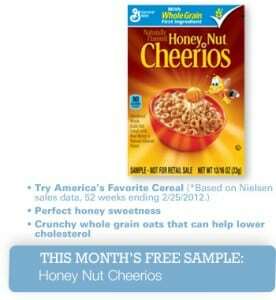 If you’ve been a Eat Better America email subscriber before 6/26, click here to visit the Eat Better America site and you’ll be able to request a free sample of Honey Nut Cheerios. Allow 6-8 weeks for delivery. My favorite cereal in the cheerio brands. Cant wait to try a sample of Cheerios!! I LOVE Huney Nut Cheerios! Cheerios are the supreme tasting cereal for breakfast. They help you start off the day with a bang and keep you going all day long. Their crunchy and crispy and you’ll never tire of them. I would like to try it and say that that is my favorite too.